Gaze upon these Miniature Accessories and you begin imagining all that you can do with them in any Festive Season. And if you're anything like me you enjoy seeing all that is available. For your miniature world there definitely is a lot of additions we can make. At any time of the year. 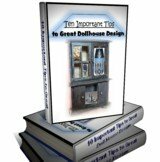 Do your miniatures need a few beautiful additions? Would a small absolutely fabulous Christmas tree add to the decor? What about acquiring decorations like you would for your own home? Only in mini. Then placing them "just so" throughout your tiny mansion. That would be a work of beauty and art together. 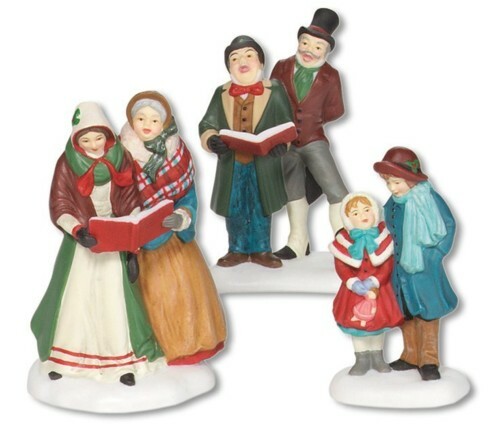 What about miniature people singing carols by the door or just outside a window? Are there winter type houses to add to the outside atmosphere? All links found on this page will open in a new window so you can study each item at your leisure. The examples on this page are from trusted names such as: Dept 56, Bradford Exchange, Hamilton Collection, and Hawthorne Village. We know the idea is to use what we see in unique and inventive ways. Never just copying but adding to it and creating our own worlds. So this Christmas decorate your mini mansion and use it for a centerpiece on display. 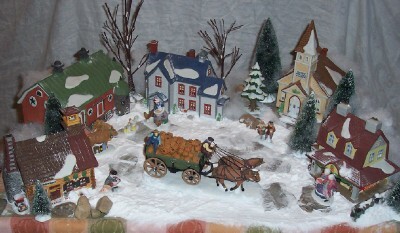 Yes instead of trimming your own living environment go wild over these Christmas Village Accessories, play and have fun. This volume breaks down displays into easy-to-read plans that show an “aerial” view of the placement of village buildings, water features and figurines. A huge help. So many great full color photos. You really see how the plan translates into the real thing! All some of us need are to see ideas in action. This is what this volume presents. Never look at ideas though and simply see what exists. Always encourage your own mind to add what you like. Adding what you enjoy makes your creative juices flow. So it can be a fun, creative and stress-free time. Want to bring your miniature displays to life in the festive season? Consider getting some of these awesome Christmas Village Accessories. Ones that will give you the desired effect you're are looking for. Be sure to check out our numerous ideas on this page. People are featured in this block of products. People give your miniature displays life-like characteristics. Without them what you create lacks realistic dimensions. Intricately incorporate people to highlight your outdoor ideas. Imaginative additions like what are included in this next section of items. Bring out the creative side in your display. Tiny pets even get in on it to set the pace for snow, play, good times and family moments. Use each piece illustrated to start your thinking processes and make this the greatest display ever. Trees: What would the season be without snowy trees everywhere? Just like that old song, "It's beginning to look a lot like Christmas everywhere you go". Yes trees make that feeling come to life. All the trees, presents, food, children and laughter. What else could you want for your mini festive town? Add tree highlights throughout your village and make it come to life. Houses and buildings for your town are shown next. Houses are what make displays even more realistic. Most people tend to think of themselves inside them. We generally like to picture ourselves in miniature displays.... Wondering what life there would be like. It's the perfect opportunity to begin dreaming. Go with the flow and make your most enchanted display ever.